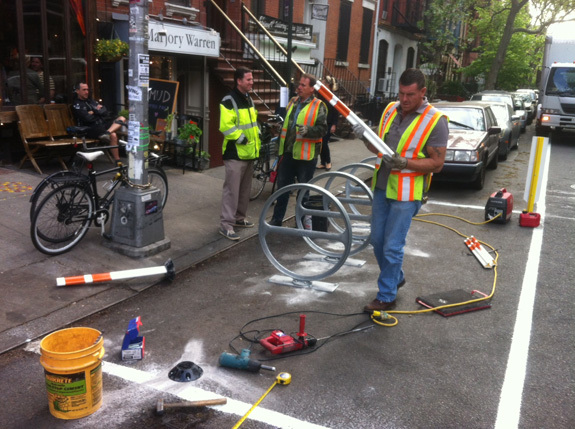 Reader Mike Epstein sends in this shot of DOT bike corral construction on Ninth Street between First and Second Avenues in Manhattan. It’s good to see this treatment expanding. Corrals that accommodate multiple bike racks offer a much more efficient use of street space than a one-car parking spot. They make streets safer by improving sight lines, and they don’t leave cyclists and pedestrians fighting over sidewalk scraps. Looks like a couple of bikes are already in the queue for this one. Oh dear. I can just see that last car plowing into those racks and any bikes as they pull out of the parking space. Does anyone know how DOT plans these corrals? I know Portland has an application process, where businesses can apply to have one installed. There is a huge waiting list in there, from what I’ve heard. Maybe something similar would work in NYC as well. Also, this is very exciting. I believe CB4 asked for more of these along the 8th & 9th protected bike lanes in Hells Kitchen in order to declutter the sidewalks for pedestrians. Genius! *sheds a tear of joy. Gives a whole new meaning to Mudspot! oh sweet slow change, we welcome you with open arms. Alas, some street space for cyclists to STOP in. May this not be limited to but 3 racks in but one parking spots, but many replicable scenarios all around town!